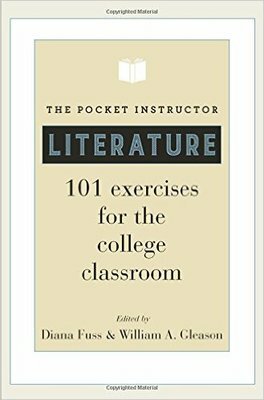 "The pocket instructor, literature: 101 exercises for the college class" by Lindsay V. Reckson, Diana Fuss et al. This is the first comprehensive collection of hands-on, active learning exercises for the college literature classroom, offering ideas and inspiration for new and veteran teachers alike. These 101 surefire lesson plans present creative and interactive activities to get all your students talking and learning, from the first class to final review. Whether you are teaching majors or nonmajors, genres or periods, canonical or noncanonical literature, medieval verse or the graphic novel, this volume provides practical and flexible exercises for creating memorable learning experiences. Help students learn more and retain that knowledge longer by teaching them how to question, debate, annotate, imitate, write, draw, map, stage, or perform. These user-friendly exercises feature clear and concise step-by-step instructions, and each exercise is followed by helpful teaching tips and descriptions of the exercise in action. All encourage collaborative learning and many are adaptable to different class sizes or course levels. A collection of successful approaches for teaching fiction, poetry, and drama and their historical, cultural, and literary contexts, this indispensable book showcases the tried and true alongside the fresh and innovative.